March | 2013 | what? bread? 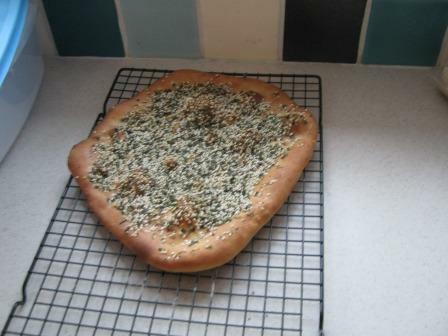 Slightly sooner than I actually intended making it, I bring you Paul Hollywood’s Maneesh flat bread from yesterday’s episode of Bread. 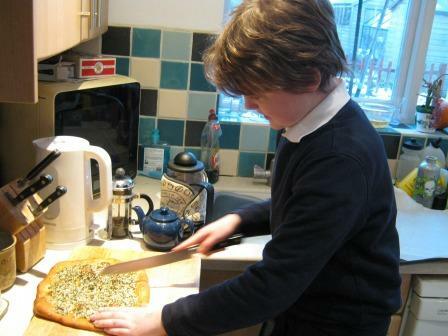 My 10 year old son was watching with me and asked if he could try making the Maneesh ‘tomorrow’. Of course I said yes, you have to encourage youngsters when the mood takes them. And as he still wanted to try it this morning, I popped into Waitrose on the way to work to pick up the necessary sesame seeds, dried thyme and dried marjoram. We dashed home after school as the window of opportunity is a bit limited in our house on a Tuesday as we have to get out to our evening activities by 6pm. So it was straight into washing hands and weighing out ingredients. As the recipe said it makes three large breads I thought we ought to do some damage limitation and divide by 3 to try to make one large maneesh. 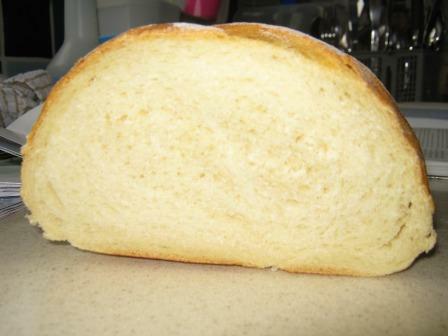 We’ve already got plenty of bread that needs eating up and there was a high risk that the boy wouldn’t like it and we’d be stuck with it, assuming it turned out OK and was like a paving slab. By dividing by 3 I could also offer cross-curricular maths while he did the calculations as to how much of everything we needed. 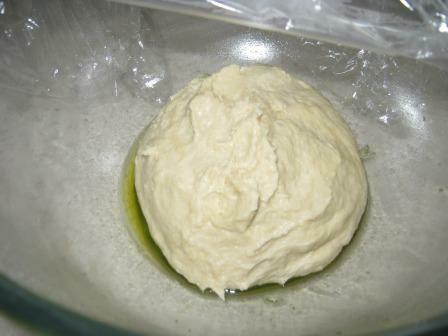 We may have had a bit more water than was actually required, and getting the dough into a kneadable state required a bit of extra oil and some flour, but eventually between the two of us it was in the bowl by 4pm, ready to rise. As previously mentioned my kitchen is Baltic so I employed a little artificial heating to try to get some life into it. Given that we had the deadline to get out by 6pm I reckoned that it was only going to get about an hour to rise, til about 5pm, then it had to be rolled and left for 20 minutes, at which point I’d put the oven on and that was all it was going to get before the topping went on and it was baked. 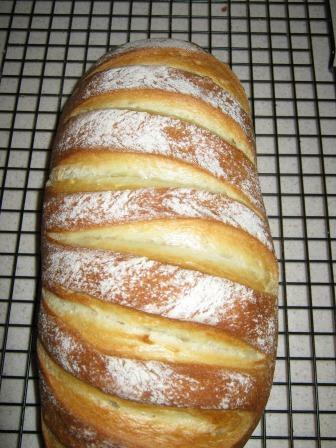 Then there was probably enough time for it to cool so we could try it before we went out. The pictures today aren’t that great but the bread was delicious! We decided it would definitely be good as a starter with dips, and he’d even like to try making it again for his Cubs ‘cooking badge’. You may, like me, have recently picked up a copy of the Tesco publication ‘Real Food’ and spotted the Red Nose Day cake made with Maltesers. If you are a Malteser fan, then this is definitely something you’ll like. If you don’t like that malty taste, you’ll hate it. 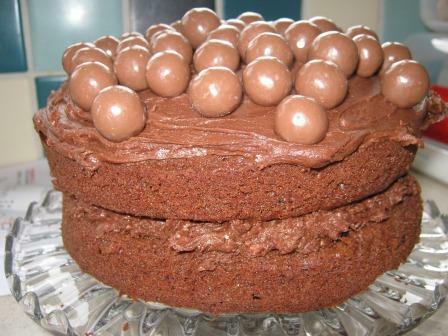 We will, of course, be baking and sharing for Red Nose Day next week at work, and I think that the Malteser cake will be featuring alongside my signature carrot cake from Stones Restaurant, so much so that I might even ‘go large’ and upscale to a four egg quantity. 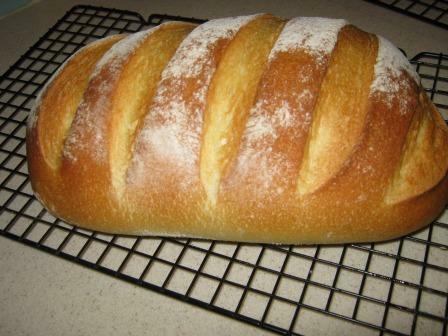 Anyway, here’s the recipe and here’s a picture of this week’s trial run. If, also like me, you find decorating cakes a bit of a challenge and that deters you from baking, this could be the place to start afresh, no skill or talent required.